COLOGNE, GERMANY, 31, JANUARY, 2011 – RTW, a leading manufacturer and distributor of professional audio metering and control devices, proudly announces that the company’s TouchMonitor series of products, the TM9 and TM7, has won an iF Product Design Award. 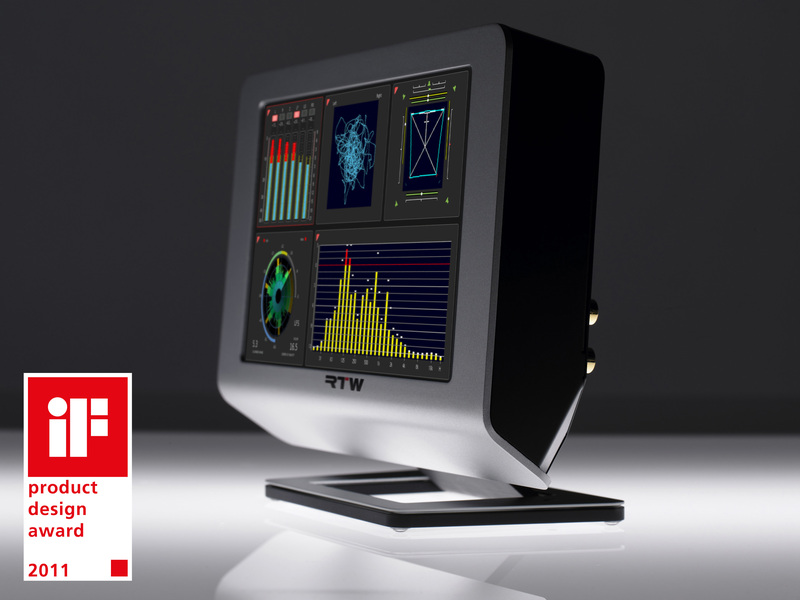 The iF (International Forum Design) jury, a global organization dedicated to strengthening public awareness of design through awards, publications and exhibitions, chose RTW’s latest line of audio metering equipment as a standout product in the audio/video category. The TouchMonitor Series, introduced in 2010 and currently shipping worldwide, is a cutting-edge approach to metering and monitoring. The TM7 featuring a 7" touch screen and the TM9 with a 9" touch screen combine unprecedented flexibility and modularity with an intuitive user interface. The innovative range of products marks the next generation in professional audio-signal metering and has garnered much attention among audio professionals and the media alike. The TouchMonitor’s operating concept based on 16:9 touch-sensitive screens is unique. It offers not only a built-in online help function, but also allows for monitoring separate signal groups using multiple instruments at the same time. This way, up to 16 analog and/or digital signals can all be displayed. In addition, the clear-cut surface layout of the cover gives the product a distinctive look, which can be consistently transferred to other RTW ranges and also allows for variations. The TM-series products are suitable for use as desktop units or for flush-mount installation. Known the world over as a “seal of outstanding design,” the iF product design award honors outstanding achievements in design. The iF product design award covers all areas of product design and serves as a platform for design-relevant innovations around the globe. Beginning March 1, 2011, an online gallery that includes all of the 2011 iF product design award winners will be available at www.ifdesign.de. RTW, based in Cologne (Germany), has more than 30 years of experience in designing, producing, and marketing sophisticated recording-studio systems. The company focuses its business on peak meters and audio vectorscopes, which are in use in the leading recording studios as well as by radio and TV broadcasters worldwide. The current product portfolio includes multichannel TFT-based monitoring systems for integrated surround-signal visualization using the unique and groundbreaking Surround Sound Analyzer. In June 2008, RTW was certified for the internationally accepted DIN EN ISO 9001:2000 quality-management standard. For more information on RTW, visit www.rtw.de, www.facebook.com/rtw.de or call +49 221 709130.